Situated near the residential suburb of Mangere, Auckland Airport is the largest airport in New Zealand. This busy airport provides the gateway to Australasia from the rest of the world. Auckland Airport is one of only two airports in the country that can handle a Boeing 747 and Airbus A380 aircraft. Auckland Airport (IATA code: AKL) is the busiest airport in New Zealand and the hub for Air New Zealand, Jetstar Airways and Virgin Australia. Flights to Auckland Airport are provided by international airlines such as American Airlines, Cathay Pacific and Emirates. AKL is a 20-minute drive from Auckland’s city centre. Book your cheap flights to and from Auckland Airport online! Not far from the coast of Manukau Harbour is New Zealand’s hub airport, Auckland Airport. In the year of 2015, this international airport welcomed more than 16 million passengers through its doors. From this destination you can access flights to Oceania, Asia, the Middle East, Europe, as well as North and South America. Auckland Airport’s story began in 1928, when the president of the Auckland Aero Club began to realise the value of the site as a location for an airport. In 1960, construction of the airport began which eventually lead to the first flight departing in 1965. Auckland Airport continues to expand today in the company’s efforts to accommodate more airlines and passengers, with more extensions planned and gates to be built. Compare and book your cheap flights to Auckland with popular flight routes from Johannesburg to Auckland online at Travelstart! 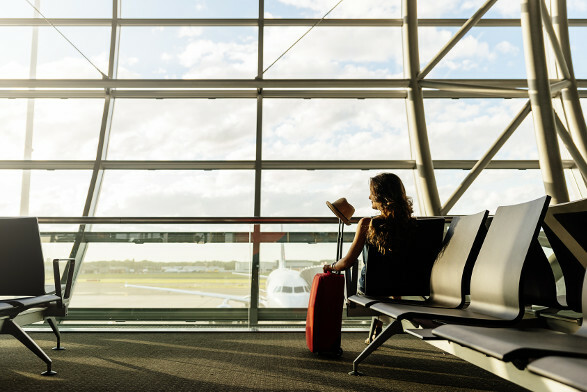 Auckland Airport features a large number of retail outlets where you can get all your shopping done or simply window shop as you wind town time till your next flight. Including duty-free shops, these establishments sell a range of products, such as sportswear, art, fashion, luggage bags, cosmetics, health products, gifts, souvenirs, newspapers, magazines, mobile phones and electronics. Make sure to take note of the baggage restrictions at the airport. Pharmacies are available at Auckland Airport to ensure all your minor health concerns are addressed. When you’ve built up an appetite, treat yourself to the various meal options at high-class restaurants, commercial fast food outlets, bakeries, cafés and bars available in the terminals. The Strata Lounge is available for travellers to relax in when waiting for their next departing flight. This spacious venue will treat you to international dishes, shower facilities, newspapers and complimentary Wi-Fi. The lounge does allow walk-ins, however all travellers need to pay to use the lounge. Booking on the airport’s website, however, will guarantee access and give you a better rate. Auckland Airport includes wireless hotspots in the terminals. The Wi-Fi is free for 45 minutes, and if you wish to use it for longer periods, you can do so by purchasing one of the offers and specials. If you join Strata Club, you can enjoy the first 90 minutes free of charge. Other facilities available at the airport include telephones, places of worship, baggage services, emergency services, medical services, luggage trolleys, currency exchange outlets, ATMs and smoking areas. ibis budget Auckland Airport This 3-star South Auckland hotel is situated next to Auckland Airport, giving travellers the convenience of a simple walk to the nearest terminal. It includes a computer station, breakfast, Wi-Fi in the lobby, airport shuttles, air conditioning, daily housekeeping and a front-desk safe. Free parking is available as well. Novotel Auckland Airport This 4.5-star luxury hotel gives you the option of a simple walk or a 5-minute bus ride to the airport. Amenities included are a restaurant, bar/lounge, Wi-Fi in the lobby, fitness centre, business centre, childcare, air conditioning, 24-hour front desk, car rentals and a laundry service. The Langham, Auckland This beautiful 5-star luxury hotel is a 20-minute drive from Auckland Airport. Its numerous features include 2 restaurants, full-service spa, outdoor pool, rooftop terrace, health club, valet parking, in-room childcare and a 24-hour business centre. In addition, there is free Wi-Fi and a free area shuttle. You will need to order your foreign exchange 60 days before collecting. You can only collect your order in person. The following documents will be required when ordering foreign exchange. Travelex offices are situated in the international and domestic terminals. Auckland Airport has several parking options, including economy parking and executive parking. These parking pays are available for short and long-term stays. Shuttles are available to take you from the parking area to the terminals. Payment machines (which accept cash and credit card payments) are situated in the pedestrian access ways at the domestic terminal and in the outer forecourt area at the international terminal. You can also reserve a spot on the airport’s website. Auckland Airport is 20 km south of the city centre of Auckland. Taxis, shuttles, buses, helicopters, Uber and car rental options are available to get you from the airport to your destination.